All transactions are safe and secure with a reliable history in online purchasing behind each of our associates. 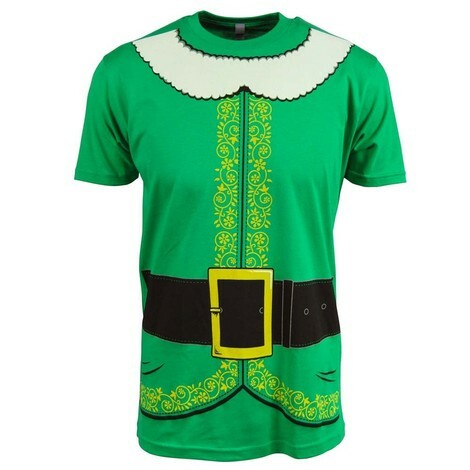 Buy the Elf Costume t-shirt to own Elf clothing and merchandise. This Buddy the Elf costume tee is ideal for anyone looking for a quick costume for Halloween or Christmas. For a more complete look with hats, shoes and more, check out our green Buddy and pink Jovie costume featured here. For an easy addition to your outfit, be sure to take along a bottle of syrup. Along with candy, candy canes and candy corn, you have the four main elf food groups. In addition to the Elf Costume tee above, browse the Elf Clothing Gallery for more apparel like men's and women's clothes, kids shirts or hoodies.